Apple mobile PCs are used in more locations than other brands of mobile PCs. 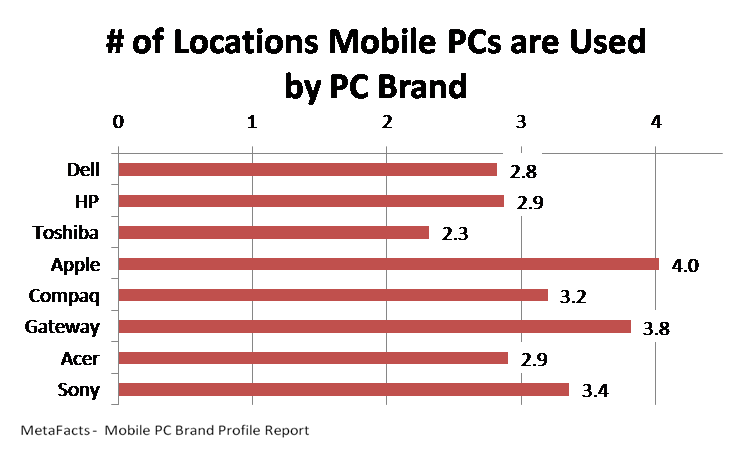 With an average of 4.0 locations, Apple bests the average of 3.0 locations where mobile PCs are regularly used. Toshiba is at the low end of the spectrum, at 2.3 locations. 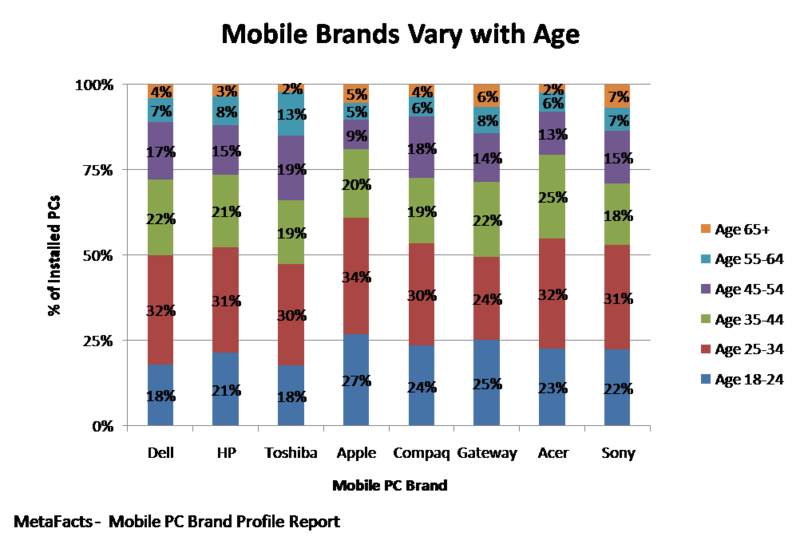 The brand of mobile PC varies by age, although not to a great extent. One exception is Apple, which has attracted a younger audience, even while keeping longtime-loyal ever-aging customers. Almost two-thirds (61%) of Apple mobile computer users who use an Apple PC as their primary PC are aged 34 and below. By comparison, only half of most mobile PC brands users are this age, ranging between 48% and 55%. At the other end of the age spectrum, Toshiba has the largest share of 45+ mobile PC users, with one in three (34%) in this age group. By comparison, only one-fifth (19%) of Apple’s customers are 45 or older, and for other PC makers, this group is closer to one quarter, ranging from 21% to 28%. To access The Mobile PC Profile Report, please contact MetaFacts. Apple can factually claim to have the most-educated users. Nearly three-fourths (71%) of households that use Apple as their primary mobile computer have attained a 4-year degree or higher. This is much higher than the 53% of all mobile PC users who have reached that level. 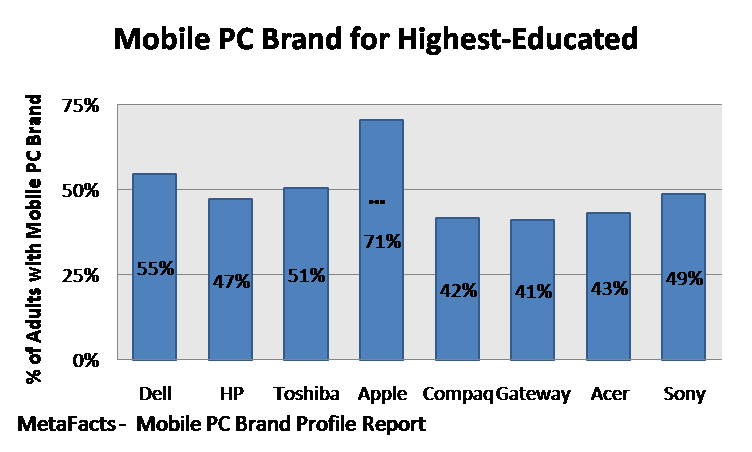 Dell stands out from other Windows PC makers by having users with the highest educational attainment. More than half (55%) have completed a 4-year degree or higher. Mobile PCs are mostly in the hands of adults age 18 to 34, regardless of brand. This group represents 47% to 61% of major mobile PC brand’s customers. 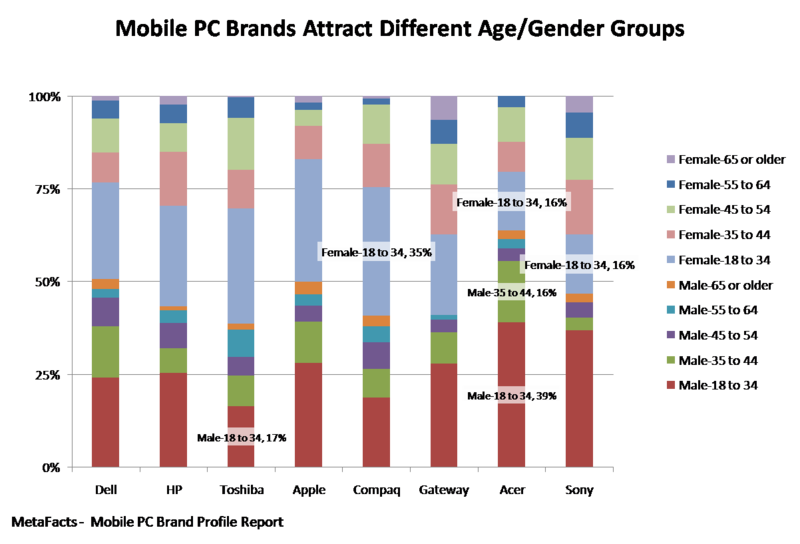 Of the pack, Toshiba is the weakest in attracting the male 18-34 group, with only one-sixth (17%) in that gender/age group, much lower than the 26% overall average and Acer’s 39%. Female age 18-34 is the strongest segment for Compaq at 35%, and the weakest segment for Acer and Sony at 16%, less than half of Compaq’s share. Probably the biggest question is why Sony, which attracts younger males in general with its many consumer electronics, has such a disproportionately small share of males age 35-44 in its customer base. At 3%, this is the smallest share of any brand, less than a third of the overall average of 10%, and less than a fifth than Acer, who have 16% of their base in this segment. The explanation most likely is a combination of Sony’s rivals being more focused on the mobile PC segment while Sony’s strong consumer electronics halo doesn’t glow brightly enough on mobile PC buyers.